The Center for Creative & Applied Media (CCAM) is a resource center for those looking to take their media skills to the next level. 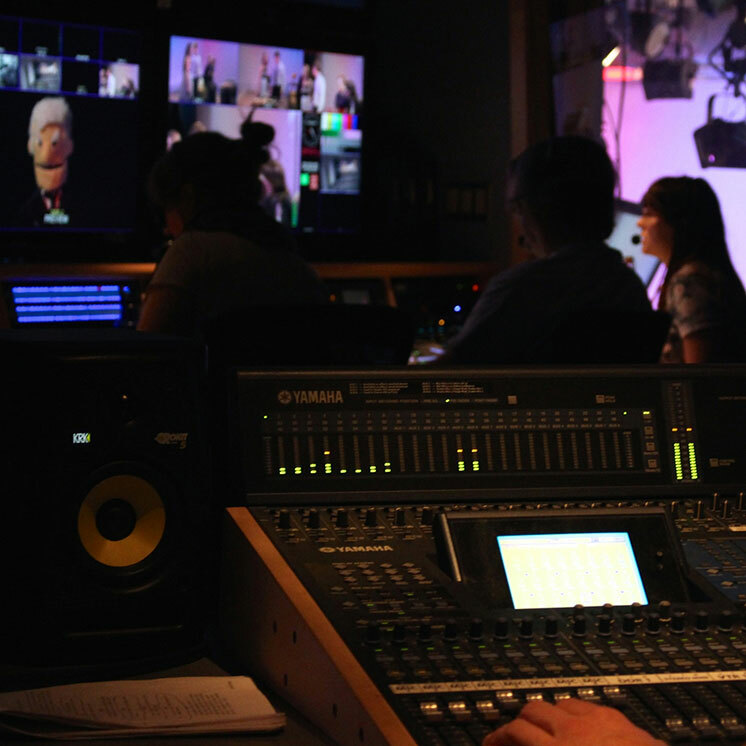 Open to all students, CCAM offers superior flexibility and broadcast-quality technology. The Center for Creative & Applied Media houses Media Engineering, Evergreen's high-definition television studio, Audio Lab, Sound Effects Studio, 5.1 Surround Mixing Room, and more — advanced media access and education in a highly-current and technologically fluid environment. Theory and practice in the pedagogical area of Virtual Learning Communities. It has the same gear as professional studios, but with access available to students at all levels. Productions can be recorded to all types of media, posted to YouTube, or streamed live on Evergreen’s website. The studios have extreme flexibility for many kinds of productions, because every year students come up with many ways to use the equipment to further their education. The full-size television studio includes industry-standard Sony HD studio cameras, a professional control room, top-notch soundproofing, and lots of effects options. The green screen setup can place your production anywhere on earth, or in space. It can be reconfigured to produce a three-camera sitcom, dance recital, news show, or poetry readings. Productions can host a traditional audience of up to 50 people, theater in the round, or no audience at all. The Audio Lab has a control room and connected studios, including a sound effects studio perfect for all the weird noises. It can be used for entry-level audio recording of all types. More advanced audio production facilities are available in the Communications Building. The CCAM is available for any credit-generating media production work. Many different academic programs use the facilities as part of the coursework, and any faculty member can arrange to have their students learn how to use them. For those looking for full-time, immersive media studies, Mediaworks is a yearlong program that links media theory with practice. Perfect for students interested in media, visual art, journalism, communication, education, and the humanities. About half of all use comes through programs where media production is not the central focus, including the Master in Teaching and Master of Public Administration degree programs. Some students also come to us independently of their program to do work related to their studies. Every year we offer internships in coordination with Electronic Media. Interns receive 16 credits and work 40 hours a week alongside the professional staff. Many of our interns go on to employment in the media industry in Los Angeles, the Pacific Northwest, and elsewhere. Find out more about Evergreen Media internships. Donations from the public through The Evergreen State College Foundation help us maintain these facilities and stay up to date with rapidly-evolving technology. Donate now or contact us if you would like more information.